This one-pan meal is very delicious and very easy to make. 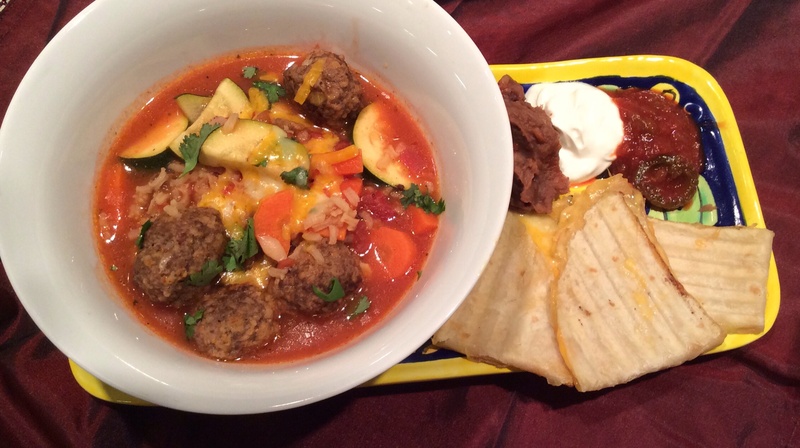 It’s a big mash-up of yummy–ground beef, rice and beans, spices and cheese. You probably have most, if not everything, to make this in your pantry already. I love weeknight dishes that I can set to simmer for a few minutes-it allows me to clean everything up while it finishes cooking. Feel free to change the spices around to your particular taste. The recipe below gives a bit of a kick but it’s not spicy (in my opinion anyway). This would also be great on nachos, Husband ate it rolled in a tortilla, I just ate it straight out of the bowl. Both helpings 🙂 Leftovers reheat beautifully. Heat the oil in a large deep skillet over medium/high heat. Cook the beef until nearly cooked through, drain, then add the onion and garlic, cook until onion is soft -just a few minutes. Drain fat again if needed. Then add the tomatoes, seasoning and spices and mix to combine. Transfer the beef to a deep plate and cover with foil to keep warm. In the same pan bring 2 cups water to a boil. Add the contents of the rice box and boil for 30 seconds. Reduce heat to simmer and cover. Cook until rice is tender and water is absorbed-about 25 minutes. If necessary add a few extra tbsp of water to cook rice. Remove the skillet from the heat, stir in the beef and then stir in the cheese. Let it rest for a few minutes until the cheese has melted. Greatly adapted from Goya’s Cheeseburger Rice recipe. So last week my Wednesday night went a bit like this: home from work at 5:40, walk dog, make a dinner in 20 minutes and get to a meeting by 6:30 that ended up lasting until 11:00. Yeah it was that kind of day. And night. I had to think of something that I couldn’t mess up, something that I could make in a flash (snicker snicker), and that had a bunch of good stuff in it and that was tasty too. Thankfully Husband made up 3 cups of rice for me the day before so it was all ready in the fridge. The rest of the recipe is a mish-mosh of stuff that I had in the fridge and freezer. And it was perfect! It was delicious, filling but not FILLING, and had a nice balance of tastes and textures. It’s more of a stir fry than a fried rice really-but who cares-it’s good and FAR better for you than stopping for take out. Next time you’re going to run short on time give this recipe a try. It took me about 18 minutes from chopping the onion to when it was in the container ready to go. In one skillet over medium high heat warm 1 tbsp sesame oil. When hot add the chicken and cook until nicely browned and cooked thoroughly. When cooked set aside. While the chicken is cooking and in another pan over medium-high heat put 1 tbsp sesame oil. When hot add the onions and stir for a minute or two and then add the edamame and corn and cook until no longer frozen. Add the fish sauce and stir for a minute or two. In a 3rd and large pan (that can hold everything and be stirred) over high heat put the remaining sesame oil and, when hot, add the rice and stir to heat through. Add the edamame mixture and cook until the rice and veggies are all mixed and the rice has a nice browned outside. In the same pan used to cook the edimame mixture, over medium heat, crack the eggs, add a spoonful of the rice mixture and mix quickly to cook completely. Add the egg mixture to the rice then add the chicken to the rice, stir to combine and remove from heat. Add the soy and hoisin sauces and stir to combine. Serve. I admit I used a bunch of pans while throwing this together. I’m sure if I had more time I could’ve figured out how to use less–but my purpose was to make a great dish fast, not avoid dirtying dishes. This recipe makes quite a bit. I took one container with me to the meeting, had some for lunch the next day and still had a bit left over. I’d say about 4.5-5 cups total. I think that this would also be great with some bell pepper strips, some snow peas etc…add at will-veggies are good for you! *if you don’t have pre-made rice it will take that much longer to make this dish. Let me start by saying that, if given the chance, I’d eat panang chicken over coconut rice from my local Thai take out place every day for forever. It’s just something that I really love-creamy, spicy, over slightly sweet super fragrant rice. It’s fantastic. That being said anything that has the red curry and coconut combo like the panang chicken gets a fast pass to the front of my ‘to make’ list. It’s just so tasty! This is a great weeknight dish. 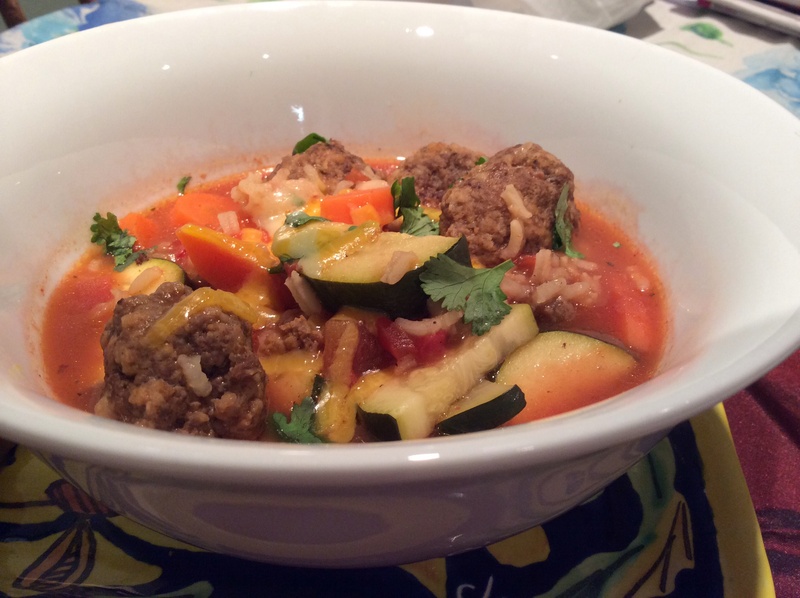 It’s very tasty, only dirties one pan and is fast to make-maybe 15 minutes start to finish. Up or lower the amount of the red curry you put in to your own taste. I also added a few squirts of sriracha too. I used 21/25 shrimp and they were just the right size. 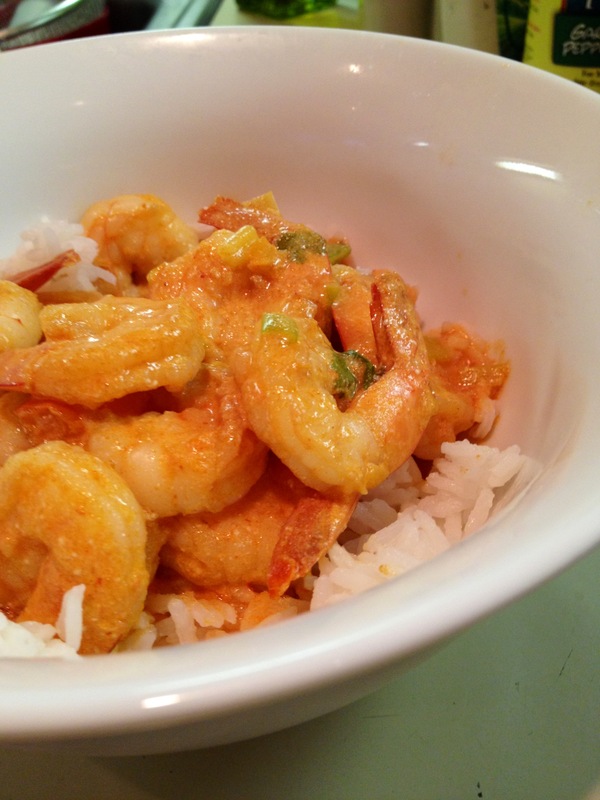 I found the original recipe on skinnytaste.com while trolling the net for some new recipes with shrimp. Here’s my adaptation. The rice is my recipe. In a large non-stick skillet heat the oil on medium/high heat. When hot add the white scallions and red curry paste and sautee for one minute or until the curry becomes very fragrant. Add the garlic and shrimp and cook about 3 minutes. Add salt if desired. Pour in the coconut milk amd fish sauce and stir to evenly combine and then simmer for about 3 minutes. Taste sauce and add more curry or sriracha if desired. Remove the pan from the heat and mix in the cilantro and remaining scallions. Serve immediately over rice or plain. Prepare the rice with water as per the package instructions on the stove. When cooking time is up add the coconut flakes and milk and stir. I used the last of the cilantro that I’ve been growing for this recipe. Do you know that when cilantro has hit it’s end it flowers? Well I didn’t. The flowers are very pretty and very delicate. 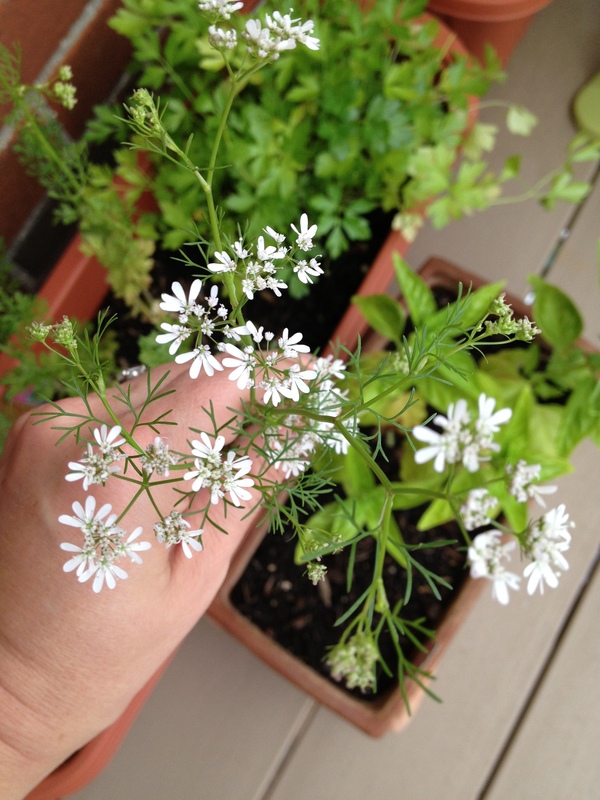 I looked all of this up online and found out that this is normal and when the flowers go away the seeds left are the coriander seeds. I knew that cilantro and coriander were from the same plant but it’s amazing to see it all going on right in my own flower pot. This rice is very very tasty and so super simple to make. Neither the lime nor the cilantro is overbearing and you can adjust them to your taste. 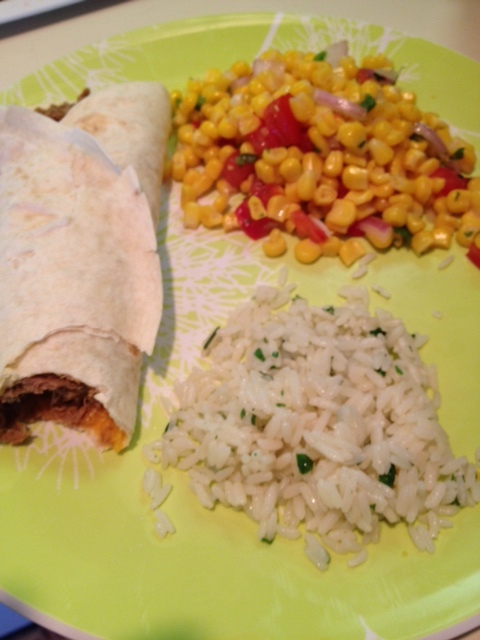 As you can see I served it with Barbacoa beef and corn salsa. It was good on the side or in the tacos! In a small heavy pot, add rice, water, 1 tsp oil and salt. Boil on high until most of the water evaporates. 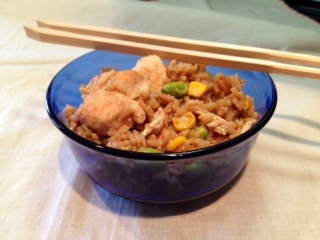 When the water just skims the top of the rice, reduce to low and cover about 15 minutes. Shut off flame and keep covered an additional 5 minute. In a medium bowl, combine chopped cilantro, lime juice, rice and remaining oil and toss until completely mixed.